1. Cut thin slice off top of each bell pepper. Carefully remove seeds and membrane, leaving pepper whole. 2. Combine beans, 4 ounces of the cheese, salsa, corn, onions, rice, chili powder and cumin in medium bowl. 3. Spoon filling evenly into each pepper. 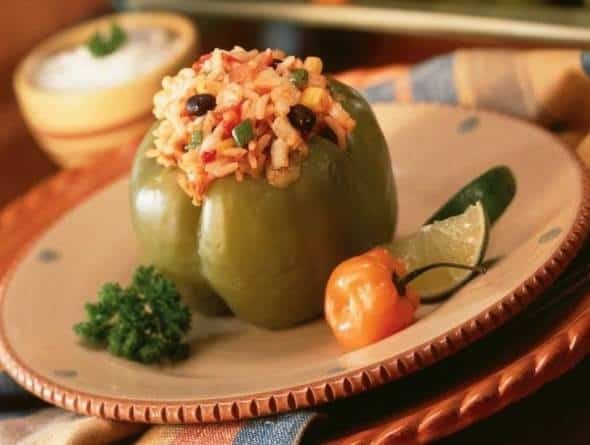 Place peppers in crockpot. 4. Cover; cook on LOW 4 to 6 hours. Sprinkle each pepper with additional cheese while still hot. Serve with topped with salsa and sour cream if desired.